Atmospheric entry and landing will occur at about 17:00 UT (1:00 PM EDT) on July 4. Cruise stage separation and jettison will occur 30 minutes prior to atmospheric entry. Like Viking, the Pathfinder lander will arrive at Mars packaged inside a space capsule-shaped entry vehicle. However, unlike Viking, which went into orbit about Mars before deploying the Landers, Mars Pathfinder is on a direct path into the atmosphere and will reach the thin upper atmosphere (defined at a radius of 3522.2 km, or an altitude of about 130 km above the surface) at a velocity of approximately 7.3 km/s. (The Viking Landers entered the atmosphere with velocities of about 4.5 km/s.). The spacecraft will be spin-stabilized at 2 rpm and will enter the atmosphere at a shallow 14.8 degree angle. A single-frequency carrier wave signal will be transmitted during entry and landing, and after some of the key entry events, a weak semaphore signal will be sent. The one-way travel time for the signal to reach Earth is 10 minutes 35 seconds. The entry vehicle's heat shield will slow the craft over the next three minutes. Peak heating will occur after about 1 minute at an altitude of 40 km. The craft will be slowed to 400 m/sec (900 miles per hour) in approximately 163 seconds. An onboard computer will sense the slow-down in speed and then deploy a 12.5 m diameter parachute at this time. (This will occur between 5 and 11 km altitude, nominally at about 8.6 km.) The parachute is capable of slowing the lander down to about 60 meters/sec (135 miles per hour) in the rarified atmosphere of Mars by the time it reaches the surface. At 2 - 9 km (nominally 6.5 km) altitude, 20 seconds after parachute deployment, the heatshield will be released. After heatshield release the bridle, a 20 meter long braided Kevlar tether will be deployed. The bridle hangs below the parachute, backshell (the top half of the entry module), and rockets. The lander separates from the backshell and slides down to the bottom of the bridle over about 25 seconds, completing the maneuver at ~4.7 km altitude. An onboard radar altimeter inside the lander will acquire the ground at about 1.5 km altitude, some 25 to 35 seconds prior to touchdown. At about 300 meters altitude (8 seconds prior to landing) the four air bags will inflate in about 0.3 seconds forming a 5.2 meter (17 ft.) diameter protective 'ball' around the spacecraft. Four seconds later, at 50 to 100 meters (165-330 feet) above the surface, the three solid rockets mounted on the backshell will fire, slowing the descent. The rocket firing may impart a significant horizontal velocity to the lander as it slows the vertical descent. In approximately two seconds, the rockets will bring the landers descent to a stop between 2 and 22 meters (nominally 12 meters or 40 feet) above the Martian surface. The bridle will be cut and the parachute and rockets jettisoned. 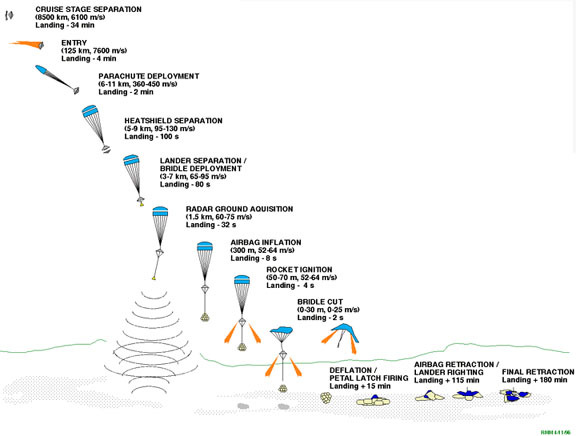 The rockets will continue to fire to transport the parachute and backshell away from the lander. The lander, nestled inside its protective air bag cocoon, will fall to the ground with an impact velocity as high as 25 m/s (55 miles/hr), bouncing and rolling until it stops. The transmitter is turned off shortly after landing. Within about an hour, the air bags will be deflated and partially retracted toward the lander. Pathfinder will then open its three metallic petals and stand itself right side up from any side that it happens to be lying on. The microrover, attached to the inside of one of the petals, will be exposed to the Martian terrain for the first time. After the lander camera has taken photographs of the ramp and rover and its position on the Martian surface, engineers will instruct the rover to drive off and begin exploring the immediate surroundings. A press release describing the testing of the landing system is available.